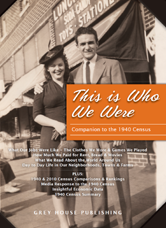 A companion resource to the 1940 Census just released by the US National Archives, This is Who We Were, provides the reader with a deeper understanding of what life was like in America in 1940 and how it compares statistically to life today. This section contains 26 profiles of individuals and families living and working in the years prior to the break out of World War II. It examines lives at home, at work, and in their neighborhoods. Based upon historic materials, personal interviews, and diaries, the profiles give a sense of what it was like to live in the years leading up to 1940. In addition, profiles with a star (*) include actual 1940 census pages, specific to the city profiled. This section includes lists of important “firsts” for America, from technical advances and political events to new products and top selling books. Combining serious American history with fun facts, these snapshots present, in chronological categories, an easy-to-read overview of what happened in the decade leading up to 1940. This section looks at a wide range of economic data, including food, clothing, transportation, housing and other selected prices, with reprints of actual advertisements for products and services of the time. It is arranged chronologically, year by year, and brings to life the economic engine that drove our country into the 1940s. This section includes reprints of newspaper and magazine articles, letters, posters, and others items designed to help the reader focus on what was on the minds of Americans in the decade prior to the 1940 Census. As they move from 1930 to 1940, these printed pieces show how popular opinion may have formed, and changed, by the time Americans responded to the 1940 Census.